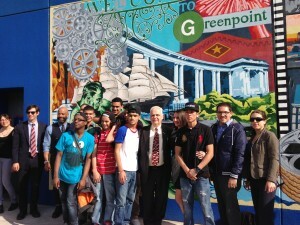 Beginning in October 2013, 24 youth artists came together to celebrate Greenpoint through the arts. Over the course of the project, the youth participants, most of whom were students from WHSAD, got to know the ins and outs of the Greenpoint by researching its history, visiting with important community members, educating themselves about the character and aspirations of the neighborhood, and translating this knowledge into a mural design. With the support of Broadway Stages Ltd., home to shows such as “The Good Wife” and “Blue Bloods,” WHSAD students learned about the extensive history of TV and film in Brooklyn; Greenpoint in particular. They learned about how the industry has transformed the neighborhood from a powerhouse of shipping and transport to one of artistic influence. This theme, as well as iconic landmarks and an ode to the immigrant history of the neighborhood, is represented throughout the mural. For the TEMA youth, this mural represents not only the history of the development of Greenpoint, but the strength and future of it as a community. 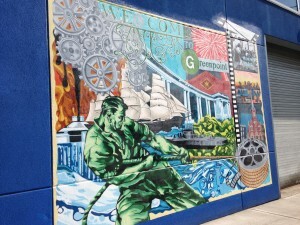 The mural celebrates many aspects of what makes Greenpoint great place to live and work. 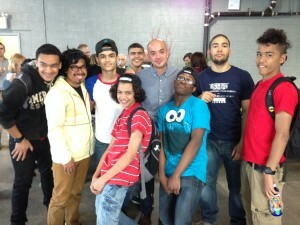 WHSAD students with lead artists Esteban DeValle and Angel Garcia. This project is made possible through the generous support of Broadway Stages Ltd., Elaine and Norm Brodsky, Roux Associates, Inc., Lori and Kevin Thompson, and the Walentas Family Foundation. 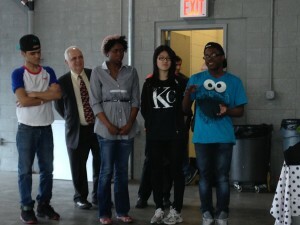 Major financial support for Groundswell’s 2013-2014 Teen Empowerment MuralApprenticeship (TEMA) program is also contributed by Altman Foundation, Ethel and W. George Kennedy Family Foundation, Lambent Foundation, Milton and Sally Avery Arts Foundation, Pinkerton Foundation, Variety The Children’s Charity of New York, and William Randolph Hearst Foundations, in addition to numerous individuals. TEMA is made possible in part by public funds administered by the New York State Council on the Arts, New York City Department of Cultural Affairs, and New York City Department of Education. Groundswell is grateful to the Office of the Mayor of New York City; the Office of the Brooklyn Borough President; and former and current New York City Council Members Sara M. Gonzalez, Letitia James, Brad Lander, Stephen Levin, and Domenic M. Recchia, Jr.
Special thanks to: Gina and Tony Argento, The Greenpoint Gazette, Greenpoint Center for Court Innovation, Assemblyman Joe Lentol, Jeff Mann, Williamsburg High School of Art and Design.